I thought deceit was reserved for recruiters and detailers, but I was wrong. 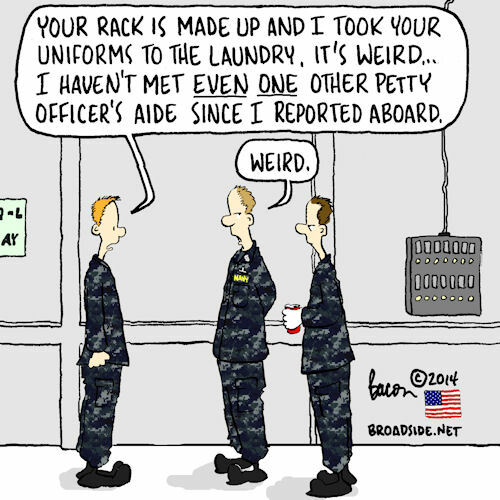 Physical therapists lie too – even the civilian ones. My therapist seems like a nice guy, but everything that comes out of his mouth is a bold faced lie. He seems so convincing when he lies to me. I see the machines. I remember how badly the exercises hurt the last time. And still I follow him, despite the evidence right before my eyes. Maybe it is pathological. Maybe he can’t help himself. Perhaps he has a pitiful need to inflict pain and will say anything to coerce me into a new contortion. Maybe he is on a pain quota system and he is using me to get caught up. Do you know what really torches me? He smiles a lot, even when he is deceiving me. The outside observer might describe him as “friendly” or a “good coach”, but I know better. Today my wife and daughter sat in on the physical therapy session and got to see his treachery in full bloom. As I cried out in agony, victim to yet another of his deceptions, I glanced over at them. Surely they would understand that I was a victim and not a patient. Do you know what they were doing? They were laughing at me. Oh, he’s good. He’s very good.